IO-HMM consists of a male-to-male IO junction with dual H2 hex heads for connecting female-to-female IO components (i.e. Triad stands and Orbit booms to IO-C clamps, IO-W wallplates, and T-ES shafts). IO-H quick-change mounting heads securely connect microphones, booms and miscellaneous accessories to TRIAD-ORBIT advanced stand system components. IO-HMM consists of a male-to-male IO junction with dual H2 hex heads for connecting female-to-female IO components (i.e. Triad stands and Orbit booms to IO-C clamps, IO-W wallplates, and T-ES shafts). 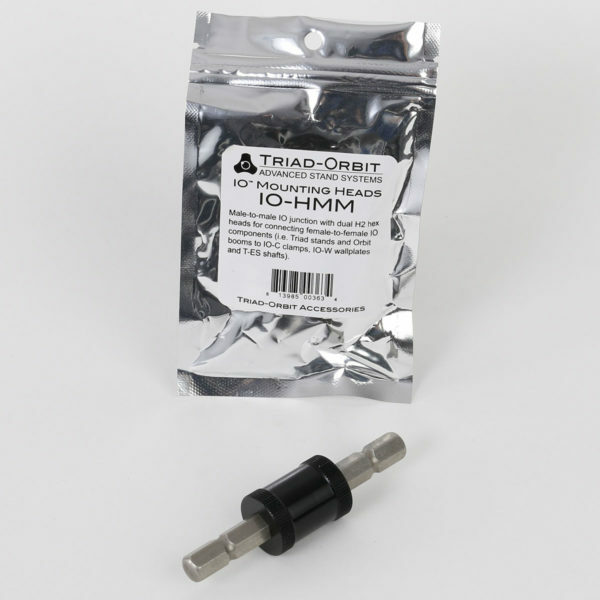 Conventional mic stands can benefit from TRIAD-ORBIT quick-change innovation with the addition of MICRO and IO aftermarket components. Retrofitting conventional stands and boom arms with MICRO-R and IO-R aftermarket components provides an instant upgrade in functionality. Live sound and recording professionals will easily recoup their investment in MICRO and IO technology by realizing instant savings from reduced set-up and tear-down times.